With a conspicuous focus on intelligent design, 134 Teaberry Lane creates a relaxing ambience within a home of sophisticated architectural features. From a driveway that sweeps across the property, the homes creamy cedar shingle facade, symmetrical gables, hipped dormers, and crisp white trim stand apart from its earth-toned neighbors. Double doors lead to a grand entry hall bursting with modern mountain style, punctuated by flashes of Lake Keowees turquoise waters through a far wall of windows. Here, a centered open, split staircase to the upper-level loft becomes art when set against rustic Brazilian cherry floors and a cathedral tongue-and-groove ceiling marked by impressively-sized timber gables. 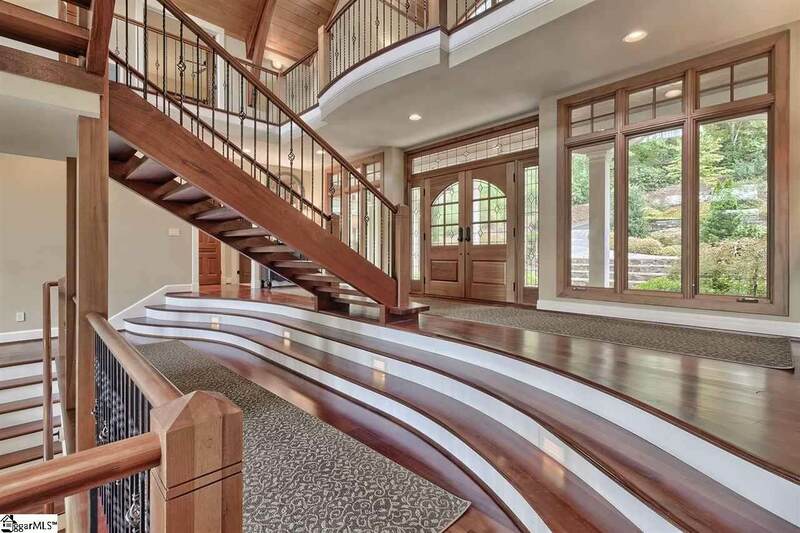 Gracefully curved steps stretch the width of the entry hall and lead down to the great room and one of many long banks of windows, which overlook a broad, private lake bay and, in the distance, the community marina and Blue Ridge Mountain backdrop. Each area of this open living space, including the great room, kitchen, dining area, and keeping room, is defined by slightly varying floor elevations and flowing stairs, such that the house itselflike the lay of the land it occupiesseems to meander down toward the waters edge. The great room is enriched by a uniquely angled stone fireplace with semi-circle hearth and copper hood, a perfect reflection of the kitchens copper apron sink, bar sink, and range hood. A broad island with C-shaped granite seating area and arched, recessed niche for the Viking range combine function with indulgent form in the kitchen. Adjacent to the kitchen is a serene, waterside keeping room with a second stone fireplace. Spanning the entire left wing of the house, the master suite incorporates an office/sitting room that also accesses both the front porch and entry hall, centrally located master bath with multi-jetted shower, jetted tub, and laundry closet, and bedroom with stone fireplace and French doors to the rear deck. A second main floor bedroom suite on the opposite side opens to the front porch as well. On the upper level, a spacious loft with bowed balcony and arched windows strikes a mid-point between a bedroom suite and large laundry room on one side, and two suites, one with a stone fireplace and bayed sitting area, on the other. A spacious family room with wet bar and the homes fifth stone fireplace is on the lower level, along with a guest suite and exercise/multi-use room. A full hall bath is conveniently stationed just inside a rear door to the outside. Outdoor spaces seamlessly continue the interiors curvilinear character: a multi-level deck finishes with a bowed overlook, and both covered and open lower-level patios boast rounded edges. Stone steps lead to a fire pit and, beyond, to rhododendron-lined pathways to the lake and deep water boat dock. While the main house holds ample accommodations for a number of friends and family, an apartment above the detached, three-car garage provides two additional bedrooms, as well as a kitchen, sitting room, and full bath, all elegantly finished (e.g., cathedral ceiling, hardwood floors and doors, double-rain-head tiled shower). This casually elegant home is tucked at the bottom of a quiet lane in The Cliffs at Keowee Vineyards, a Lake Keowee community offering a Tom Fazio golf course, restaurants, full-service marina, miles of trails, on-site equestrian center, and other amenities.